Ovation Ladies Flex Field Boo.. Wear the Flex Field Boots for Style and Comfort. The Ovation Ladies Flex Field Boots feature traditional styling but have been totally redesigned for ultimate comfort and ease of movement. The new Flex System pattern design affords the rider freedom of movement with full flexion of the ankle area right away with no break-in time. 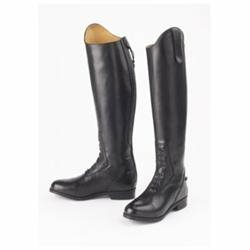 Calfskin leather along with full grain glove leather lining creates a masterpiece of equestrian footwear.